The ADRC attended the 22st meeting of sub-committee on space technology and applications (SCOSA) held from 9th to 10th May 2011 in Siem Reap, Cambodia. Various organizations in ASEAN countries which are related to the space technology attended this meeting in order to discuss on-going and future projects by SCOSA and other relevant. .
For the last two year the ADRC has been implementing "Satellite Data Utilization for Disaster Risk Reduction and Response" funded by Japan-ASEAN Integration Fund (JAIF). Eight ASEAN countries, namely, Indonesia, Philippines, Lao PDR, Myanmar, Thailand, Vietnam, Cambodia and Brunei Darussalam are the target countries of the project. In this meeting, ADRC made a progress report on the project. ADRC is currency producing materials to be used at planned seminars and trainings in each ASEAN country. The Training of Pilot Teachers for "Promotion of Disaster Education of Schools" project was held in Vientiane, on 10th and 11th March 2011. It was organized jointly by the Ministry of Education, the National Disaster Management Office (NDMO) and the Asian Disaster Reduction Center (ADRC). 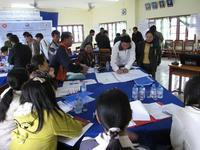 More than thirty teachers of primary and secondary school attended this two-day workshop. Participants took lectures about "Earthquake Disaster Risk Reduction in Japan", "Basic Knowledge about Natural Disaster", etc. On this workshop, Dr. Goto, senior researcher of National Institute for Educational Policy Research, had a lecture "Latest Situation of Disaster Education in Japan" including earthquake model exercise. Therefore, participants joined in this workshop with a passionate concern. As a result of elaboration and discussion, a pilot lesson and seminar will be held at the beginning of March. ADRC collaborated with Ministry of Education in Lao to organize the second coordination meeting for "Promotion of Disaster Education of Schools" project. First, ADRC and the task-team discussed latest situation on disaster education in Lao for conducting a Training of Trainer (TOT) and Pilot Lesson. Then ADRC and the task-team visited 2 target schools. It was followed by a meeting with Ministry of Education's officials, the principal and teachers of a pilot school in Vientiane. As a result of discussion, ADRC and the task-team decided that a training program for school teachers will be held at the middle of March in 2011. First Coordination Meeting for Japan-ASEAN Integration Fund Project "Promotion of Disaster Education in Schools"
ADRC held the First Coordination Meeting for Japan-ASEAN Integration Fund Project "Promotion of Disaster Education of Schools" in collaboration with the Ministry of Education of Lao People's Democratic Republic. In the meeting, the project outline was introduced by ADRC. Then, Ministry of Education reported the latest situation of disaster education in Laos. Some materials and teacher's manual have been already developed in Laos, and it is agreed to effectively use these existing materials for our activity. Hereafter, the teaching materials will be drafted for the Training of Pilot Teachers. Asian Disaster Reduction Center (ADRC) conducted the program "Capacity Building of Utilization of Satellite Image for Disaster Management" in Vientiane, Lao PDR from 14 to23 July 2010. This program consisted of one-day seminar and five- days training both to promote the utilization of space based technology, and it was conducted in collaboration with Asian Institute of Technology (AIT), and the Remote Sensing Center of Water Resources & Environment Institute, Water Resources and Environment Administration under Prime Minister Office (RSC/WREI/WREA), Government of Lao PDR. Satellite Images were utilized to estimate flood damages and to implement emergency activities when Vientiane was heavily inundated in August 2008. Through this experience, a shortage of engineers capable of applying space based technology to disaster management was recognized so that capacity building of engineers in relevant fields has become an urgent need. ADRC will continue to cooperate with RSC/WREI/WREA and other relevant agencies to further promote the utilization of satellite data in the field of disaster management in Lao PDR. ADRC also plans to conduct this program in other ASEAN countries. For more details of this project, please visit the following web site. ADRC has been implemented the project for the satellite Imagery Application to Disaster Reduction facilitated by Japan-ASEAN Integration Fund (JAIF). Eight ASEAN member countries, namely, Indonesia, Philippines, Lao PDR, Myanmar, Thailand, Vietnam, Cambodia, Brunei Darussalam, has participated in this project. ADRC in cooperation with the Asian Institute of Technology, AIT(http://www.ait.ac.th/) will be organizing a seminar and training in each country to enhance their capacity of satellite imagery application to disaster reduction. To this end, the first round of kick-off meetings, were held in each country as shown below.